I have been researching and experimenting with tool grips for quite some time. Recently I have begun to solidify my research and decided it was time to figure out how to make the perfect tool handle, make it well and make it consistently. Part of my goal here is to provide a handle form that does not need a lathe to turn. I wanted to make this something that would inspire and allow budding craftsmen to use, make and repair hand tools. First off is the specialized shooting board for making octagonal tapers! Then we will make a jig for boring straight holes into the handles. Lastly we will make a bit for drilling straight holes. You will need some decent 1/2″ or so plywood, some screws, a length of drill rod and some nice lengths of stable wood that is about 2″ by 2″. Here is my shooting board for making handles. Don’t worry too much about it making no sense to the eye. Think of it as Toolmaking Art! This abstract wall hanging is a tool for making tools! This is a guide for the controlled removal of wood from a handle blank. For this to work well you need a nice and quite square block of wood, a bit longer than the handle you plan to make. The shavings shown are about as thick a shaving as I can make with the plane shown. All this really is, is a V-Block with a tapers cut into the sides, mounted on a chunk of plywood. The taper on the left of the V channel is 1 to 16, the taper on the right of the central v channel is 1 to 4. At the ends of the V-Channel are holes drilled for dowels to keep the handle blank from moving with the plane. By using this to plane a square block, the corners can be removed to make it roughly octagonal. Then the original sides can be planed down to match the taper of what used to be corners. The end result is a nice octagonal cone. It can take forever to plane down the sides initially, shaving at a time. so a rough saw cut not too close to the final dimension can help speed up the process. Then a plane can run along the side of the shooting board and quickly make an nice smooth surface. Here is the handle blank half finished. If you look close you can see where the plane made a rough cut into the grain. Because of the angles involved, this will usually not happen if you saw off a bit of waste first. Here is the handle nearly finished. A bit of hand sanding or shaping will still be needed to make the transition between the front and back tapers even and smooth. Here is how I made the shooting board. First I started with a V-Channel cut into a block of cedar. I like cedar because it is inexpensive and reasonably stable. The V was cut to be slightly less that a 90 degree angle, so that slightly uneven blocks would still be held stable. Note here, that a block that is not very close to square is used to make a handle, the result will be an handle that is not at all close to octagonal! Here is the back of the same V-Block. I am using my reference cone to check the line I drew for a guide. Here is how I made the line. I wanted the taper to be 1 to 16. For accuracy, I try to use as much length of measuring tools as I have. So I decided to use a 1.5″ rise to 24″ run. I ‘Burned’ an inch, that is added an in to the measure, so I was not using the end of the rule. But instead of doing it right, and measuring along the length, I measured using the hypotenuse. Yep, I made a stupid mistake, fortunately I did not use my measurements. Because table saws are dangerous, I use a rail saw for power cutting. Since the saw blade runs right down the edge of this aluminum rail, I can place a block of wood beneath it and make a precise cut. So I lined it up with the cone in the V-Channel. The cone is not visible since it lines up with the edge of the rail. But the shadow of the cone is visible . Then I lowered the rail, adjusted the saw and cut the taper. See how the cone fits nicely with the taper cut in the side of the V-Block. 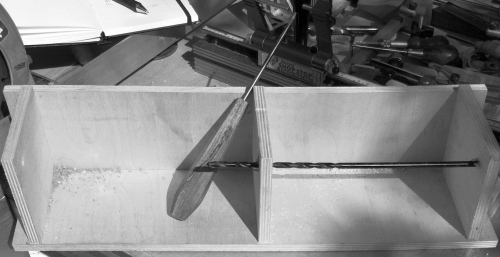 The center tool handle was made using the shooting board shown. The cone and the handle on the right used the much funkier and less pretty prototype. Here is the jig for drilling a straight hole. I used screws to hold this together. Three square blocks sitting square with two long sections of plywood. I used a long drill bit, and lined it all up with an aluminum L-Channel to try and drill a fairly straight set of holes. Since I had a lot of area for holes if I messed up, I was ready to drill another and try to do better. The drill bit was tested as straight by rolling it on a granite plate. Then it drilled the first two holes and made a divot at the end for the tool blanks end point to register with. Before drilling I make a nice divot in the end of the tool handle to center the drill bit in. Then the handle blank is centered into place with it’s point in the divot. I hold the handle while the drill bit cuts the initial hole. After getting the hole started, I let go of the handle to see if it is centered and straight. It is easy to see a ghosted edge if the handle is off center in any way. Below the photo of the spinning handle shows that I have everything right! Sadly the photo below shows that the end result of drilling gave me an off center hole. The truth is, I fooled myself into thinking this would work. I really did not want this project to be complex and require much metal working, so that you the reader might be inspired to actually follow these directions. Sadly, my goal blinded me to something I knew. Most drill bits wander with a deep cut into wood. Drilling into endgrain is the worst. Constant force make the bit flex and follow the path of the least resistance. This compounds and makes for an irregular hole. What you need for drilling this sort of hole is the same sort of tool that was used in the early days to drill gun barrels straight. Did I say, used in the early days? This technology has not changed much, apart from putting a hole through the center of the drill to pump oil through to lubricate the drilling, the shapes are much the same, apart from a hundred or so variations. So what we need here is a shell auger! Here is how I made one. First I took a drill rod blank the size I wanted. Then I ground a skew on the end and a flat taper from the point to about 4″ back on the rod. This rod is 1/4″ soft, unhardened tool steel. Normally this steel is basically shaped, hardened, tempered, and then the finished shape is made. In this case we are just going to file it into shape and use it. It will dull comparatively quickly, but it will be easy to sharpen. Not all edged tools have to be hard. I filed a flat taper about 1/16″ deep at the end of the rod, so that filing would be less and be easier. It is easy to skate off of a round surface when filing and scar the exterior that you want to remain smooth. Here is a nice rounded channel tapering to the point. 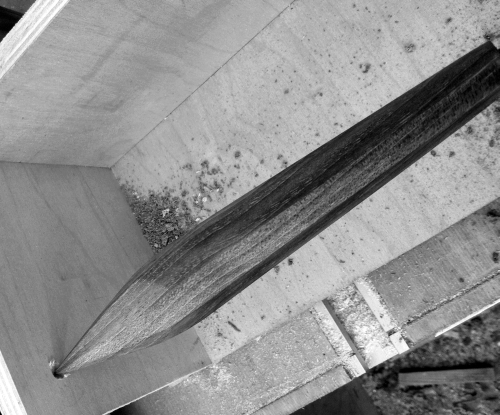 The taper is nice, since as I sharpen this, the end will be reduced, and the channel deepened. The taper means I can keep the same profile as I use and sharpen this tool. 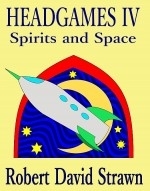 The channel makes a moon shaped profile at the end of the bit. The deepest part of the channel, just barely reaches the center of the rod. The bevel on the end of the shell auger drops away from the groove edge and away from the leading point of the auger. This gives clearance for the cut to be made. 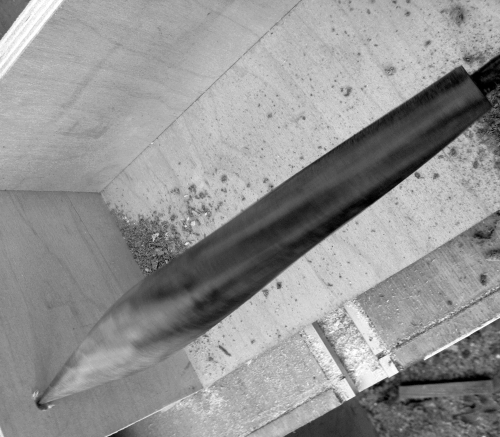 The actual cutting edge of this auger is the intersection between the longer half of the groove and the end bevel. Because this tool cuts only on the face of the tool, and slowly scrapes material without digging in, it makes a straight and centered hole. Here it is ready to be used. Because a shell auger does not start with a center point, I made a hole first with a spur bit to initially guide the auger. A shell auger is slow, and needs to be removed to clean the hole regularly. It can also get hot quickly. Not that I am afraid of ruining the temper of this one since it was never hardened. It scrapes instead of digging in and cutting so it does not make chips typically, it makes powder. Here is the tool handle drilled with a shell auger, spinning in place. Perfectly centered on the alignment divot. Here is a close up of the handle spinning. Shell augers work! Now when I put a tool into the handle it sits straight and true! The shell auger made from unhardened tool steel needs sharpening after cutting holes in two handles. With some fine sandpaper on a flat surface the end bevel can be cleaned up. If the channel needs to be cleaned up too, fine sandpaper bent around another section of drill rod will do a good job of polishing it. There you go, a compete process for making octagonal and tapered forms. Keep in mind that a straight octagon can be made with just a v-block cut to size and not taper at all. Let me thank Ray Gardiner for straightening me out when I was chasing a rabbit down a hole on this, and Steve Wirt for his interest, information and encouragement. This project took me on quite a few detours and turns and I would have been much, much more frustrated by it without their imput. Really a nice read. The bit about the shell auger is interesting. I’m not sure I am ready for that yet. I may just have to stick to socket tools…. but then again, you did make it look pretty easy. The shell auger took me from 1 in 4 drilling success, with 1 of those failures blowing a hole out the side, to 7 in 7 success so far. A shell auger is an easy drill bit to make. You can even take a dull drill bit and often grind it to make a superior shell auger that will clear waste much better. If it is an old M2 drill bit it will hold it’s edge for a long time as well. The only tricky part is matching the divot to the start of the spiral. P.S. I am relieved that the comments work. From the Stats page it looks like my provider had a huge crash corresponding with the loss of quite a bit of stuff and horribly mangled file rights. You just figured out a problem I was having! I needed to make a gun drill for drilling ramrod holes that can be up to 48″ in depth in American Long Rifles. Now I know how! Great handle making jigs, I’ll be refering back when I finally get back home! Also ebay has lots of good deals on gundrills. I took a piece of mesquite – you know where it came from – and chucked it in my dad’s old metal working vise and drilled it with my power drill from standing above it. I did have to pay a goodly amount to get the size and quality of drill bit needed. You guessed it, the bit wandered a little and it was not quite centered in the blank. So I redrew the handle profile in pencil to shift the center of the handle over to the tang hole. Then got after it with my drawknife and shaped it to exactly fit my hand. 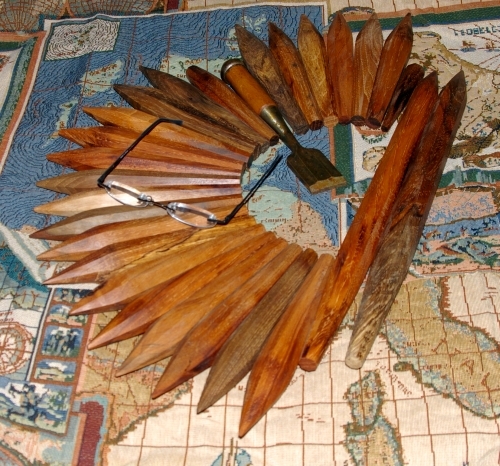 The most difficult part was continuing to sharpen the drawknife as I went along – mesquite is tough! Then I used JB Weld to hold the mortise chisel tang in the handle. It’s very ugly, but fits my hand and cuts mortises like a champ….. I need to make a project with that size mortises I guess…. Great hearing from you, Skip! I think it will be hard to beat a handle that was hand shaped to fit. This also personalizes a tool in a way that stamping a mark will never do. After many years of tinkering,I am finally entirely satisfied with a handle form. I have taken a few and then worked them over to see if I could improve my personal grip on the tools in question, and have not found the results so far to be superior to one that was left alone. I still have a lot of other handle shapes that I have made and like, and have no urge to redo them, apart from a few handles that are really quite lame. But for the most part, any new handles will be made using these methods. Well – I may be back talking a little bit to a selected few folks – but personal time is still hard to come by. My ww’ing over the past 16 months has been limited to that necessary for my weekend chores. My last project of crown molding on the kitchen/dinette ceiling was so bad I may never do another one. Anyway, my “tejas” chisel handle is about as ugly as they get, but that mesquite is some tough stuff! Of course, that huge ReedMaster blade needs something suitable for pounding all day… not that I’ve used it on a project yet. Considering how long it took me to carefully make (carve) one handle, I think your method is the way to go for making more than one at a time… just odering a large drill bit and then figuring out how to drill it straight was a major project of it’s own… your drill box lines’em up just fine. And yes, they’re plenty rustic, no need to worry. I have made quite a few, since making them is rather addictive. I end up using them for all sorts of odd things. I just made one into a small lime squeezer for my better half. I rounded the fat end and then carved teeth into it. It’s very convenient to have a bunch of good spare handles laying around. That said, I can’t brag that they are the fastest thing to make. They still take a bit of time and work. Thanks for taking the time to share this. It is a very useful and easy solution. I just got some chisels off ebay that need handles – this helps a lot. It must be my screen, but, I can’t see The shooting board clearly. I can’t see the groves for holding the handle material on the board for planing it. It can be your screen, but it also can be the oddity of the combined angles is such that the mind has difficulty seeing the angle. With the reference of the square handle, look at the top of the image above and you may be able to see the angles. In the blurry image below, you may be able to resolve the angles. In the following image, if you look at the bottom you should be able to see the groove. Then if you move you gauze upward you may be able to keep the reference in your mind and see it at the top of the image.